It looks like they landed the capsule separately by parachute and then landed the rocket on the landing pad. The landing is just amazing. 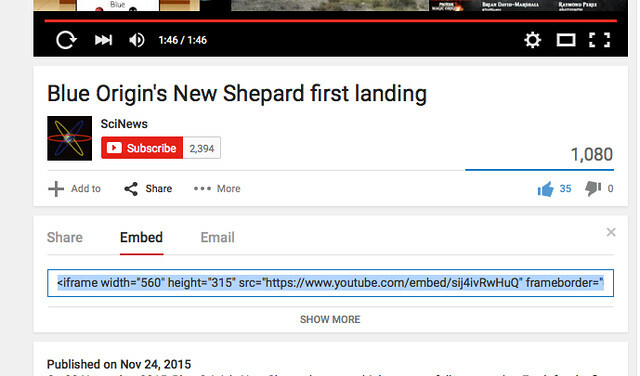 If you go to the Youtube page for a video, there is an option to "share." When you click on that, there are a bunch of icons for various social media, including Live Journal. But I ignore the icons. Just above the icons are the options Share, Embed and Email. Select Embed, copy the code they give you and paste it into your post via the HTML tab. At least I think that's what I did. If it doesn't work, let me know and I'll figure it out for sure. Thank you! That's very clear.